Risk and returns are related to each other. Investors know that if they want higher returns, they need to accept higher risks. That means riskier investments should offer larger rewards than safer investments. This is generally true in the stock market. Investors usually earn the largest returns in smaller companies. These companies carry the risk of business failure. Large companies tend to offer lower returns than small companies. But they carry less risk of a large loss. This relationship between risk and reward extends beyond the stock market. A bond issued by a large and stable company like Apple Inc. (Nasdaq: AAPL) should pay a higher interest rate than a Treasury bond. That’s because Treasurys are risk-free, so anything is riskier than a Treasury bond. Apple is unlikely to default, but it does carry more risk than the U.S. Treasury. In fact, an Apple bond due in two years does pay a higher interest rate, 2.3%, than the two-year Treasury, which yields 2.1%. That’s just one example among millions. Higher risks mean higher returns. The chart below shows the exception to that rule about risk, at least for the past 60 years. The dividend yield of the S&P 500 since 1871 is in blue. Yields on 10-year Treasury notes are in green. From 1871 until 1958, stocks provided more income than bonds. This follows the rule that higher returns come with higher risks. In 1958, the relationship flipped. There is no explanation for why this happened. And it isn’t logical. Stocks are riskier than Treasurys. They were in 1871, in 1958 and still are today. The risks of stocks are widely known. Bondholders have priority over stockholders in bankruptcy, for example. In many bankruptcies, stockholders get nothing. Stocks are riskier outside of bankruptcy as well. Interest on bonds is guaranteed. Dividends on stocks vary, and are often reduced or eliminated when a company hits a downturn. Despite the risks, for the past 60 years, stocks traded as if they were safer than bonds. But that could be changing. Over the past year, the gap between the yields narrowed. This tells us markets are rethinking what risk means. 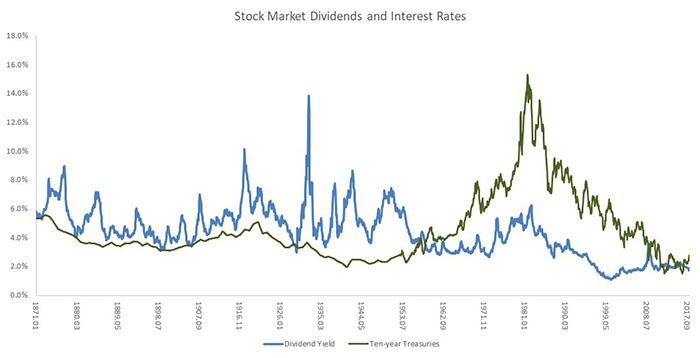 Over the next few years, expect both dividends and interest rates to rise. In the past 147 years, dividends averaged 4.4%. Interest rates averaged 4.6%. And inflation averaged 2.1% a year. These numbers provide targets for the next five years. Soon, investors will be able to enjoy income from their savings … just like they did in the good old days before interest rates fell to zero and investors ignored the risks in everything. Now, markets are re-evaluating risks, and investors will be rewarded as that process unfolds.